NVIDIA has released alternate graphics drivers for macOS High Sierra 10.13.3. These are separate from the drivers Apple ships as standard, and should be considered experimental. These drivers have been known to solve OpenCL issues with certain applications, as well as providing better native GPU power management for certain devices. NOTE: These drivers are currently the only method to get full acceleration for GeForce GTX 1050, 1050 Ti, 1060, 1070, 1070 Ti, 1080, 1080 Ti, TITAN Pascal, and TITAN Xp 'Pascal' graphics cards and NVIDIA GeForce GTX 750, 750 Ti, 950, 960, 970, 980, 980 Ti, and TITAN X 'Maxwell' graphics cards. There are no current Macs with these cards, so support is absent natively in macOS. If you've installed the drivers before, you may get a notification to update to the new drivers from the built in System Preferences pane. In order to use the alternate drivers on a CustoMac, you must first install the driver package. As of macOS Sierra, nvda_drv=1 in config.plist under Boot > Arguments is no longer working to initiate drivers. Clover has been updated with a new System Parameter setting called NvidiaWeb. There's a new method for enabling the NVIDIA Web Drivers in the latest versions of Clover. It can be turned on and off by editing /Volumes/EFI/EFI/CLOVER/config.plist to add SystemParameters/NvidiaWeb. This takes the place of nvda_drv=1 boot flag, which will not work in macOS Sierra+. Emulated NVRAM is required for support of NVIDIA Web Drivers on many desktop systems. Use MultiBeast to install Bootloaders > Clover UEFI Boot Mode + Emulated NVRAM. This allows for menu bar switch between NVIDIA Web Drivers and OS X Default Graphics Drivers. 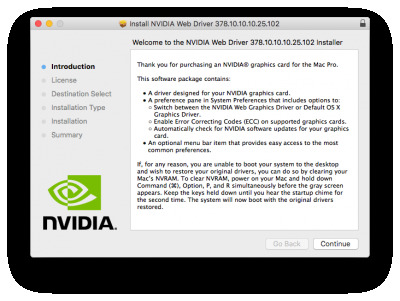 I think the NVidia Web Driver Download page on here has a broken link for the 10.13.3 Web driver. As of this post, NVIDIA's own XML download link from the built in System Preferences pane (and our own NVIDIA Drivers page) has errors and will return a 404.
update went well, but I've got more sluggish screen drawing than previous version of MacOS and nvidia driver. Anyone else getting slow animations or slow/lagging video playback? Yep in the plex media app it sounds kinda glitchy. Plex web app in chrome has no problems. I have a GT 1030. Yes, I do. So much inside of the browser, maybe nVidia will release a new driver. DO NOT USE THIS DRIVER! It causes terrible lags. There's definitely something wrong with this driver release. I thought maybe something was wrong with my system, so I tested on a clean install and still lots of lag everywhere.